- 100% cotton 84-96 Chevrolet ZR-1 Vette Apparel is comfortable, durable, and preshrunk. - Silk screen artwork on this Exciting As Ever C4 Corvette T Shirt for detail and longevity. - 84-96 Chevrolet ZR-1 Vette Apparel design is on BACK. Small design on chest. - Color of Exciting As Ever C4 Corvette T Shirt is WHITE. - Buy American... 84-96 Chevrolet ZR-1 Vette Apparel is printed in the U.S.
- Exciting As Ever C4 Corvette T Shirt brand varies... Hanes, Gilden, Fruit Of The Loom. - New 84-96 Chevrolet ZR-1 Vette Apparel arrives folded and bagged. This 84-96 Chevrolet ZR-1 Vette Apparel makes the perfect gift for the Exciting As Ever C4 Corvette T Shirt enthusiast you know. Wear it yourself to display your interest in 84-96 Chevrolet ZR-1 Vette Apparel. High quality 100% cotton Exciting As Ever C4 Corvette T Shirt is preshrunk, durable, and comfortable. Silk screened artwork on the 84-96 Chevrolet ZR-1 Vette Apparel has great detail and is long lasting. Increase longevity of this Exciting As Ever C4 Corvette T Shirt further by turning inside-out before machine washing and tumble drying. Design is on the BACK of the 84-96 Chevrolet ZR-1 Vette Apparel. Small design on front. Shirt color for this Exciting As Ever C4 Corvette T Shirt is WHITE. Licensed 84-96 Chevrolet ZR-1 Vette Apparel is printed in USA. Brand of the Exciting As Ever C4 Corvette T Shirt varies... Hanes, Gilden, Fruit Of The Loom. 84-96 Chevrolet ZR-1 Vette Apparel is delivered folded and bagged. 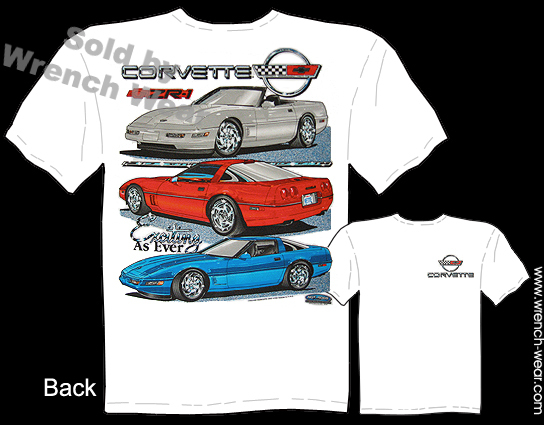 Refer to the size chart on this page to choose the correct size Exciting As Ever C4 Corvette T Shirt. See our other 84-96 Chevrolet ZR-1 Vette Apparel here. Shopping results for Exciting As Ever C4 Corvette T Shirt. All of the 84-96 Chevrolet ZR-1 Vette Apparel designs are owned and licensed by their respective owners, subsidiaries, affiliates or licensors.